It is my belief that every student has a right to be numerate and I'm launching my campaign of Numeracy 4 All in an attempt to raise awareness of this issue. More often than not schools are focused on developing literacy across the curriculum and put numeracy on the back burner. This is mainly due to the teachers own negative opinions and fears of mathematics. To tackle numeracy across the curriculum and you need to start with the teachers. To empower and improve upon numeracy across the curriculum I believe there is a set logical order schools should follow, which is under pinned by the principle of starting small and aiming big. See figure 1 'the numeracy chain' below. The Numeracy Chain is a chance to chunk down a challenge and solve the problem from the root. I think I should make it very clear here to say teacher fear and teachers being innumerate are two separate arguments. In my personal opinion all new teachers have to pass QTS maths tests and it has been this way for a while. The majority of teachers can complete basic numeracy tasks, however ask them to put these tasks into a lesson you will find many teachers have the same fear as our own students of getting it wrong and embarrassing themselves. Therefore it makes sense to start with the teachers. Talk to teachers from across the school, see what they are already doing, you might just be surprised. Ask them about how they feel about numeracy and what they think numeracy is. Talk to staff as a whole about numeracy and create a numeracy working party. Launch and stress the importance of Numeracy 4 All to staff. Begin with a bang, have guest speakers into the school, run charity events, have a theme and ask every member of staff to put a numeracy activity, however big or small, within their lessons. Encourage staff to seek you or the numeracy working party out to ask for help, support and ideas. Provide staff with a subject matrix and links to fun and exciting maths topics around your weeks theme. Talk to staff and ask for feedback from departments on what mathematical knowledge will be useful for them and what topics do they need support with. Make videos of the generic topics for the staff to use within lessons or to watch for their own development. This will improve teachers confidence. I would also look into running CPD sessions for those departments most in need of support. 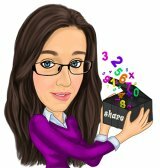 Get staff talking and sharing ideas, create a teaching and learning blog or even just a simple sharing display within the staff room, where staff can pin up their numeracy ideas, this can be done anonymously for those staff scared of the 'geek' factor . Use the numeracy working party members and teaching & learning team to present ideas and resources that can be used across many different departments. 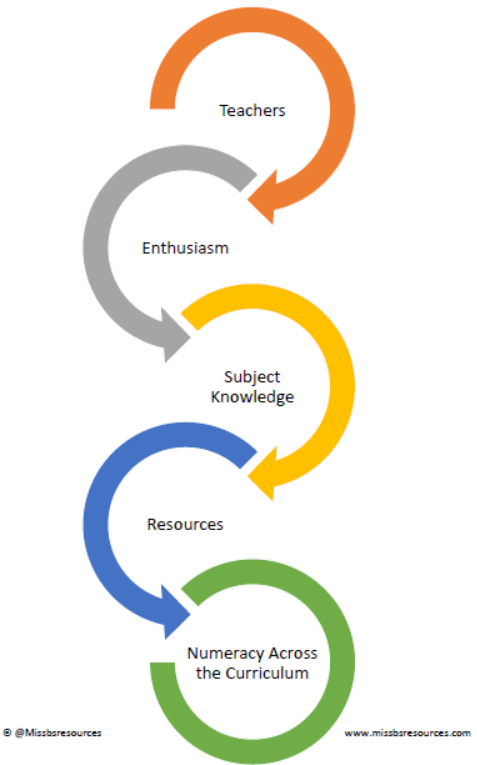 Hopeful once you have covered all of the above and have in place a support structure for staff whether it's in the form of videos, a numeracy co-ordinator, a blog or regular staff training; you should be seeing that numeracy is spreading across the curriculum. To continue your forward projection work with departments to make these numerical aspects clear within their own schemes of work. All of the above is just my opinion on the matter and the order in which I have decided I need to follow to support my colleagues in developing numeracy 4 all. I really am lucky enough to be working at an amazing school, which is like a family. All staff are extremely supportive of the core subjects.